Getting ready to sew on day 1 of my mini-break. Summer can sometimes be a challenging time for me. Social media is flooded with vacation photos of beaches and mountains and faraway places (the pictures of Norway and Sweden are amazing) but probably the hardest pictures to see are pictures of cabins in the woods on beautiful clean lakes. It makes me want to just jump into the picture. This one is from a real estate listing is exactly the kind that gives me pangs. But it turns out that being at home can also be wonderful. I used to spend summers in Maine. I was incredibly lucky and I will always treasure those summers. But that is just not my life right now. I work two jobs and I don’t have the money or time off to travel. But one benefit to not having a lot of time off is that when you finally do take a break, you appreciate it so much. I recently had 5 days off in a row. I didn’t go anywhere and I didn’t really do anything fancy or extravagant but I had a great time. Here is what I did. I spent a lot of time on my front porch-reading and eating simple meals both alone and with some of my kids who were home for part of the weekend. Lunch on the porch below: I made a nice breakfast with home made berry muffins for my family, most of whom were with us. It was great to have a big group around the table. I used the pretty china and picked wild flowers from the garden. I love big family gatherings centered around a nice meal and my kids live far away so this was a treat for me. We also had a taco night with part of the group the night before and a dinner out at a favorite restaurant with my two daughters and son in law. It is a place we had gone to many times when they were younger so that was a special evening. Staying on the topic of food, I ate a lot of tomato and fried egg sandwiches-both separately and together. If I had to pick one favorite food it would probably be fresh summer tomatoes. I remember reading this book as a child and not really getting why the main character ate tomato sandwiches every day for lunch but I get it now. I could be perfectly happy doing that. Or alternating with a fried egg sandwich with avocado on good bread. These are my new favorite meals. Quick, inexpensive, delicious. My husband bought this mayonnaise by mistake one day and it turns out to be the secret ingredient. and a new pair of Luna pants for me in a fun print. and I started work on a baby quilt for a friend. I decided to make a whole cloth quilt and hand quilt it. It was fun to make and not having to piece the top ended up making it less stressful. It also made the hand quilting much easier since there were no seam allowances. While I quilted, I listened to this audio book which is really terrific. 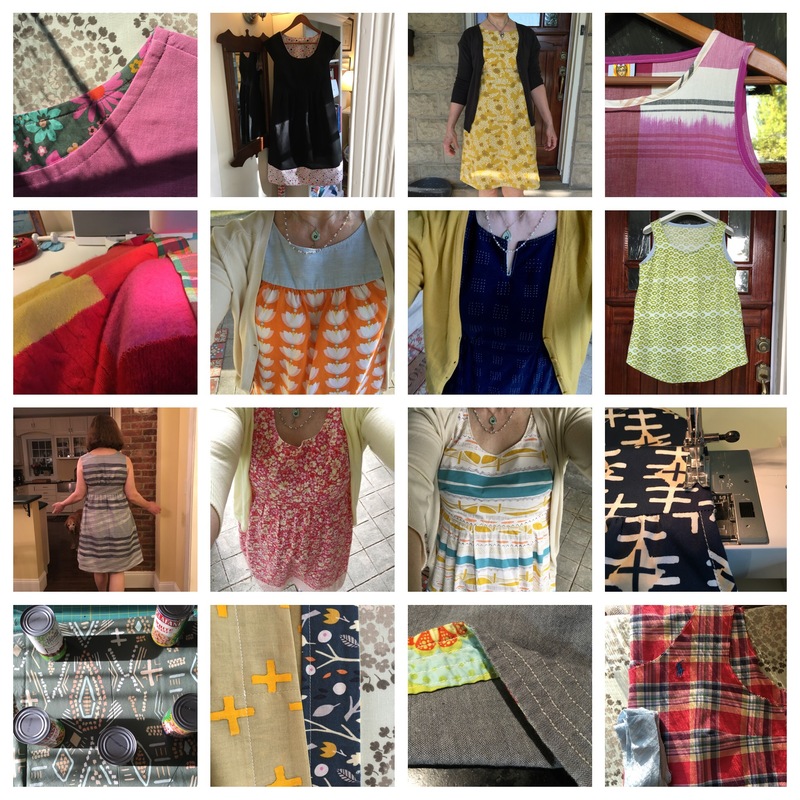 Each of the sewing projects were things I had made before and which weren’t super complicated. This meant that I was able to complete a new garment in a day which was really fun. While I love trying new patterns, there is nothing like the tried and true pattern that you know by heart and which fits you well. Cut, sew, wear, repeat. Boom! I went to a great yoga class with my daughter and I did yoga on the porch the rest of the days. I am loving 30 days of yoga with Adrienne. I had a diner breakfast with my daughter and son in law and then my daughter and I got our toenails painted in summer colors before they flew back home to the mid-west. I miss her already. New Luna pants in the wild below. And then it was back to reality. At least I had a new dress to wear my first day back. It sounds so very relaxing, my holiday was nothing like that but I so wish it was, having the time to chill and do what you want in you own time must be blissful, my three teenage children did not help but their getting older so hopefully my time will come. I love the idea of yoga too. I totally understand. I had many years with no time to myself. Just in the last year have started to relax a bit. The yoga with Adrienne is really good. Can’t recommend more highly. Loved Harriet! Totally wanted to be her! A favorite aunt gave me that book when I was ten. Best gift ever!